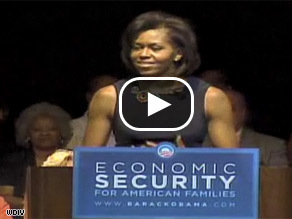 Watch Michelle Obama's comments . (CNN)— In the wake of comments from presumptive Democratic nominee Barack Obama that he regretted allowing his daughters to participate in a television interview and would be avoiding similar situations in the future, wife Michelle Obama said again Wednesday she had initially asked her husband not to run for president because she didn’t want her two children to endure constant media exposure. The potential first lady said she eventually decided that supporting her husband’s presidential bid would be the best move she could make for her daughters — that she wanted them to grow up in a world where there weren't any limits on what they could achieve. “I had to step back and take off my ‘me’ hat and put on my ‘citizen’ hat,” Mrs. Obama said. I am with you first lady. Don't settle for someone who's so fundamentally flawed that they put national security before the freedoms of its own people! You watch tomorrow when the Senate votes on the FISA bill, and you decide who is most likely to protect you from an over powering government. I pray Obama will make the right choice. And the haters to spew their venom ... 1 ... 2 ... 3 ... On cue with now with that fraction of tissue in your head that you have the gall to call a brain. Ahh ... Feel better now that all your self-hatred is transferred to someone else?! Look in the mirror, pathetic patriots! Access Hollywood? You speak with fork-tongue woman. You love the national attention your husband's candidacy has brought you and you are so looking to sleeping in the White House. You'll exploit your daughters to get there. Tell it like it is and stop your lies; it's getting old. Michelle, everything will be alright, Barack will be alright, the girls will be alright and the media, will be alright after Obama becomes President! The country should be grateful that you took off the 'me' hat and put on your 'citizen' hat. Because the country does need hope and change. And your girls are just cute! You just gotta love Michelle Obama's style! I don't know what it is about dark skin that blinds so many people. It's just skin. This is truly ridiculous! Michelle said no to "protect her kids." Please. Then she set them up to be interviewed to make them look like the all-American family. So what did Jesse Jackson say that CNN won't print????? Brandon Hillary PUMA for Mc Cain-Pa – I really don't think women should be forced to keep their opinions to themselves and neither do most Americans. Perhaps you and your fellow sexist McCain supporters should look long and hard at yourselves in the mirror and figure out why you hate women so much. There is no fault to be found in Michelle – she is human like you are. Your racism is showing with every criticism you make. She didn't want her husband to run for President. Then she puts her kids on parade. Right sure Michelle . We believe it. She was using her daughters to get votes. Can you imagine her as first lady. Yuck!!!!! Go Michelle... we love your militant approach to life and your marxist self. You are the worst black person I have ever met. You are a disgrace to our country and your race. Go back home to Chicago and think about how to better yourself before preaching to us. There's still time to get yo man back to the streets of Chicago. This should concern many who want Senator Obama to be our next president. If he uses poor judgement regarding protecting his own family, then what judgement will he use in protecting all the citizens of the U.S.? Seems he good at making bad decisions. She's said this in almost every speech that she gives but now CNN wants to try to tie it in to the family interview so they can keep the story going and have campbell brown beat up on Barack and Michelle again like she did last night. I would be very happy to see her represent me as the First Lady. I do hope he wins! He should also regret letting Michelle open her mouth as well. "This woman is a beast and should not be allowed in the role of first lady." Yeah, are you sure ? YOU WAN'T A PILL POPPING EX-DRUG ADDICT, WHO STOLE THE HUSBAND FROM A CRIPPLED WIFE TO BE YOUR NEXT FIRST LADY ?? I loved the interview. No need for Obama to feel bad about it. I find them all to be down to earth. Some people who voiced negative comments on the issue are not Obama supporters...what do you expect them to say?! Come on!!! This woman continues to concern me. Having watched her throughout the campaign–both when she spoke to black and then to mixed audiences I always got the feeling here is an angry woman. Her college thesis, her membership in a black liberation church, and her comments about being proud of America all reflect her values - and those of the likes of Rev. Wright - hate and racism. Sorry, she may well be a good mother but I don't believe she represents the America I believe in. She took off her, "me" hat and put on the, "ME" hat. She likes the ring to, "First Lady," yeah! "Forget about the kids, man, I'm gonna be First Lady, but, I'm doing it for the country, of course, because they NEED me.